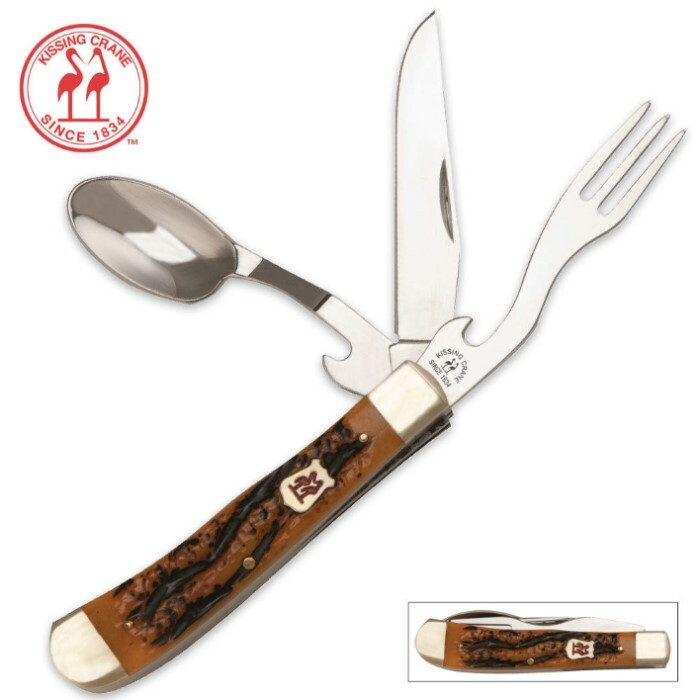 Dine conveniently while camping or in survival situations with this deluxe camp dining knife set! This three blade folding knife disassembles into three separate dining utensils. The spoon, fork and knife blades are each forged from CRM0V17 high stainless steel and designed to withstand the elements. Additional features include can opener cutouts on the spoon and fork blades, amber jigged bone handle scales, and polished bolsters. Measures 7 1/2 in. opened, 4 1/4 in. closed. I purchased this knife because I enjoy collecting high quality knives and this one certainly fits that description! It separates very easily and the reassembly is the same! I also have the yellow handle version of this knife and I've ordered another one of these! I like to be prepared when I show this knife to a friend and they want to know where to get one then I already have an extra one to give them! I'm even considering taking it to a restaurant just to see the reaction I get from people! I purchased this knife due to the fact I enjoy collecting KC knives. This knife is very appealing to the eye, sturdy, and ready for action! The knife section is sharp and ready to take on the toughest of camp fire meats. (If your a veggie then slurp your tofu) The spoon and fork sections fit nicely onto the knife section. This knife is larger and heavier than you might be used to. If weight is a deal breaker then you might think twice, but all in all this knife is better than the cheaper brands. I ordered this knife because I like Kissing Crane knives (I have collected them since they were made in Germany). The handles are beautiful, the knife sharp and sturdy, the utensils separate easily should one want to use them in true "Hobo" fashion. 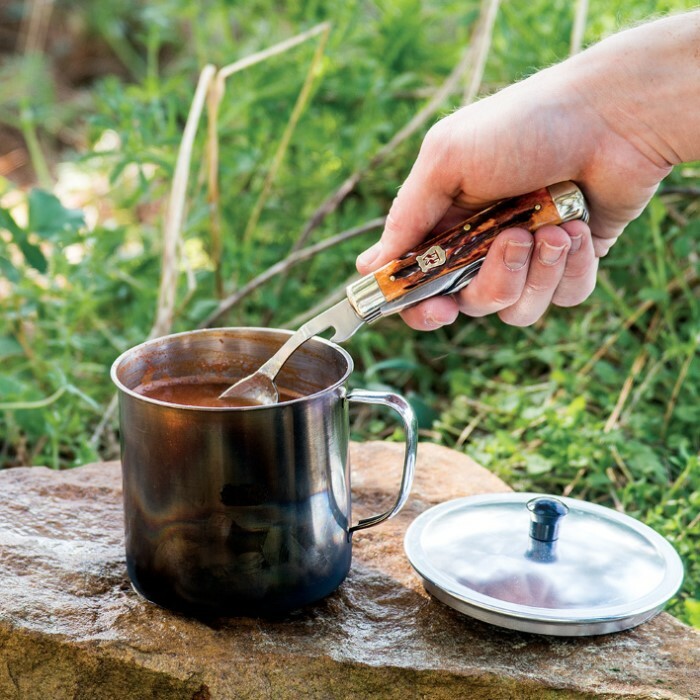 It is doubtful serious hikers would purchase this knife as their "mess utensel" as it is heavier than would be wise on a long, self-supported, hike.